Humans are a shell filled with Rich Existential Power - but aging and its sidekick "Neuro-degeneration" have the ultimate power. The power to empty the contents of that shell. The SHELL of MAN [or woman]. The person you love so much seemingly gone, yet you're still able to physically see, hear and care for them. The memories are gone for them, now yours to keep safe. A topic that is easily pushed aside because a cure DOES NOT EXIST, but, how can we change this? Alzheimer’s Disease is #6 cause of death in the nation!! LIFE EXPECTANCY IS ON THE RISE!! A true understanding of the way life is taken by AD is challenging and nearly impossible to truly comprehend unless you've had a direct experience - whether a witnessed account or personal story. Sara's mother was just 54 years YOUNG when she contracted the most notorious of neurodegenerative diseases – Alzheimer’s. At that time, her doctor suggested she take up crocheting as a stimulating brain activity. More on this in a minute. The image you are about to see was created in the two years following her official diagnosis. As you can imagine, her symptoms progressively worsened during this period, and she was eventually forced to put her crocheting materials away for good. 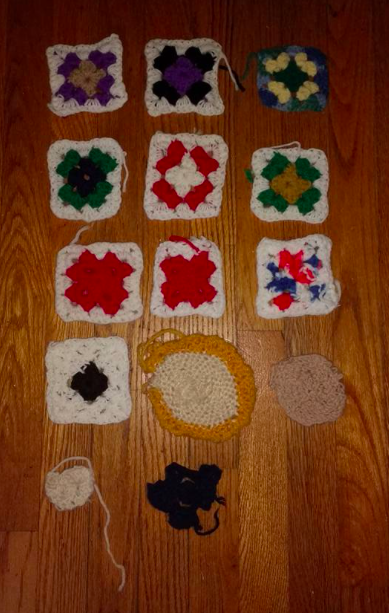 Until one day when Sara (her daughter) came across the crochet memorabilia. Needless to say, she was impacted by the mural. It’s sometimes difficult to put into words, how such a disease can affect a person’s mind, but this picture is worth a thousand words. With neurodegenerative disease, it’s like the person you've always known somehow fades away. It can be somewhat eerie, for those who have never witnessed it. Sara was moved by the entire experience and says it has really changed her outlook on life in a very positive way. As she states, neurodegenerative disease has a unique way of giving you a new appreciation for the gift of life. Neuro-cognitive disease is a progressive condition which means that we can actively do things to PREVENT IT, before the TIPPING POINT. Her story has attracted an overwhelming amount of LOVE from the community, and we couldn’t be happier to lend our additional support. We are SO EXCITED to see the fundraising pot grow for this family!! 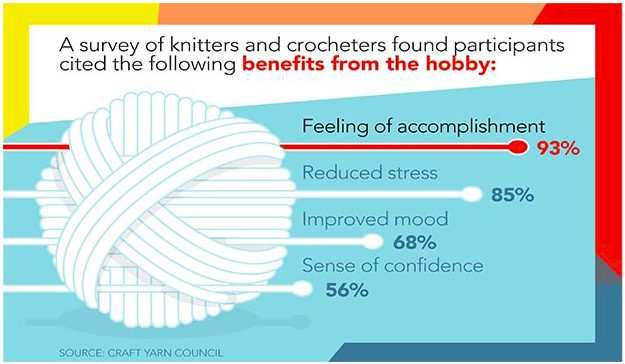 CROCHETING is GREAT FOR THE BRAIN! Not quite the level of learning a new language, but crocheting is a fantastic neuroprotective activity! It stimulates the brain to keep neurons firing and blood flowing. Even better is KNITTING! Studies show that both activities are awesome for reducing stress, stimulating creativity, improving memory, and boosting your mood. Stimulated brains are healthy brains, and those who actively do so are better able to fend off neurocognitive diseases like Alzheimer’s and Dementia. WANT MORE WAYS TO COUNTERACT THIS DISEASE, AND MORE? Seriously, we’ve got A FREAKING TON of exciting content coming soon! ONCE AGAIN THANK YOU SARA FOR THE AMAZING STORY! TO ALL: Please direct message us to join us on one of our many missions to combat ALZHEIMER'S, as we actively strive towards a clinically stronger brain.